I have spent a thrilling half an hour this evening sharpening pencils. All for a good reason – my contribution to the BigLittleCity Exhibition, which opens this Thursday, is an interactive project called Postcards from Cardiff. People will be telling and scribbling their stories of Cardiff onto postcards, and writing tools are therefore a necessity! 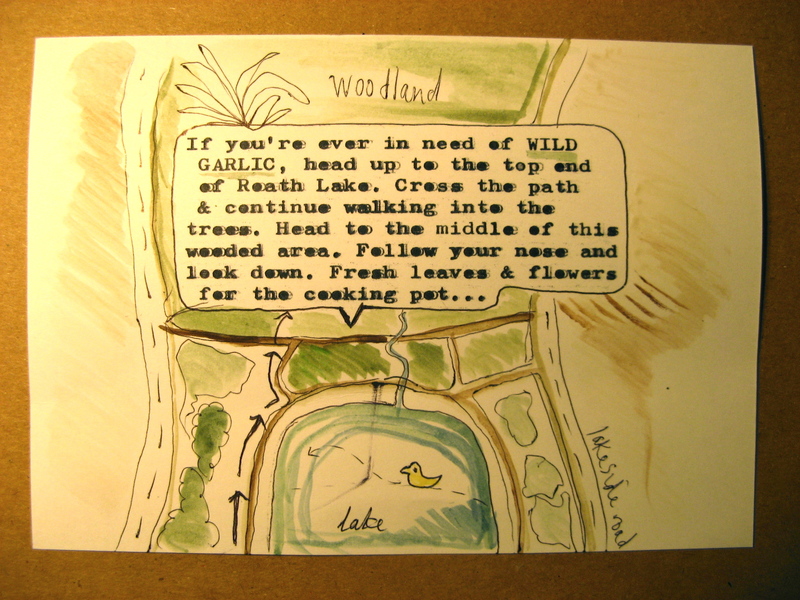 5000 blank postcards, with brief instructions were brought into the world last week. 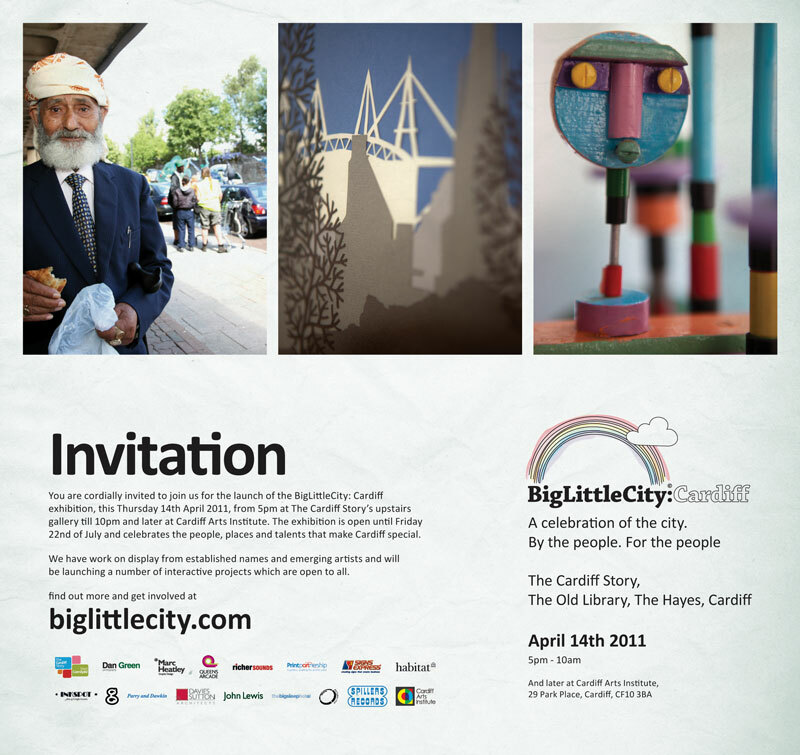 They will be distributed around the whole of Cardiff and also available from the exhibition. The format is similar to the Shoe Tales project which I curated last year, and the project has something for everyone. Share a memorable Cardiff moment…A gem of local knowledge, a top tip. Whether you’re a resident or visitor, tell us your experience of Cardiff, what you love and what you don’t. 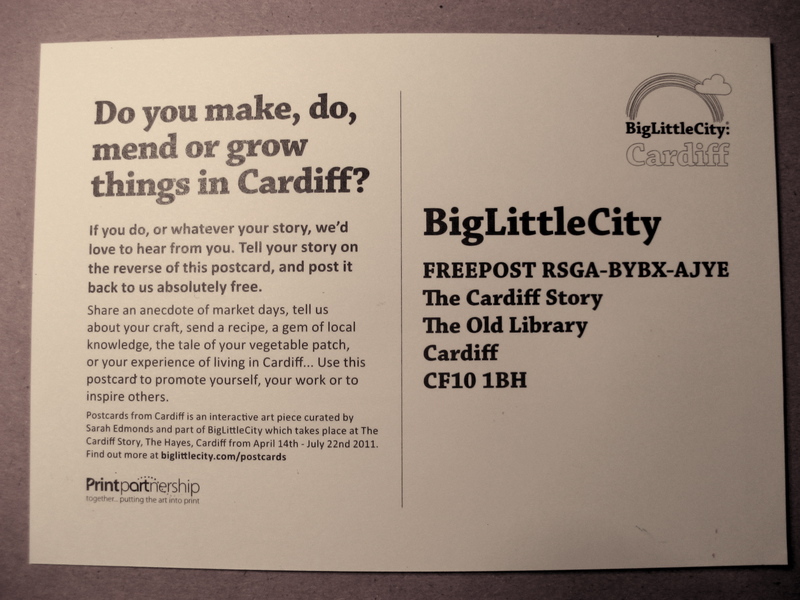 : You can use this postcard to promote your own work / inspire others / say something about this city and be part of a BigLittleNarrative. The postcards received will be displayed for the duration of the exhibition. The space will also be built upon, for example quotes from completed postcards will be written on the windows.So keep visiting! Feel free to contact me (sarie8@gmail.com) if you have any questions about this project or would like to take part. If you’re free please do come along to the opening of the exhibition this Thursday. All of the artists on show are very talented and it has been a pleasure working alongside them. Not to mention photographer and BLC project leader Mr. Daniel Green, my hat goes off to all your hard work and encouragement! This book is about an old man who walks up and down his village while he waits for a visitor. 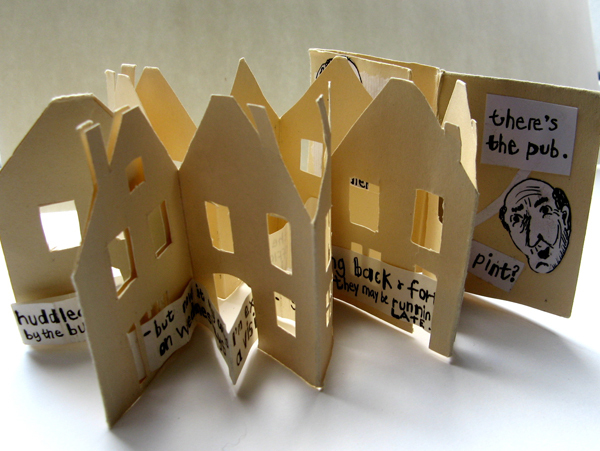 It’s a folded book, the pages cut out in the shapes of houses, then a separate strip of card with the text on it threaded through the doors. More of these little story books coming soon! 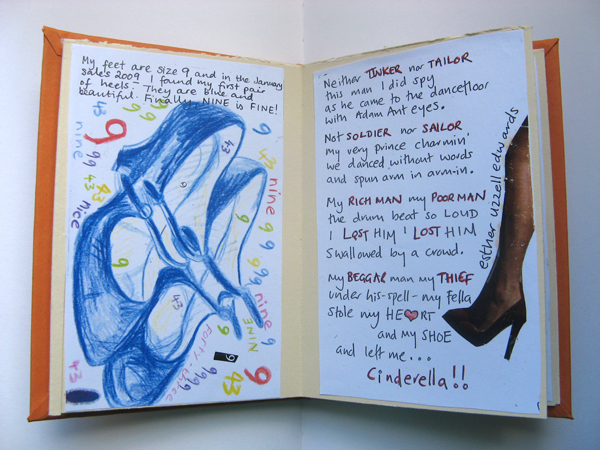 The first version of the Shoe Tales postcard book – photocopies of the original postcard stories are fixed in a folded book. It has a very neat finish, but I want the final edition to be more interactive! A great book I’m reading – Indie Publishing: How to Design and Produce Your Own Book – has some great tips for making books by hand, and ideas aplenty!